The Fitchburg Sportsmen's Club sits on 900 acres of land spanning both sides of Route 119 from the New Hampshire border East to Mt. Watatic State Land on the left and down Pierce Road on the right. 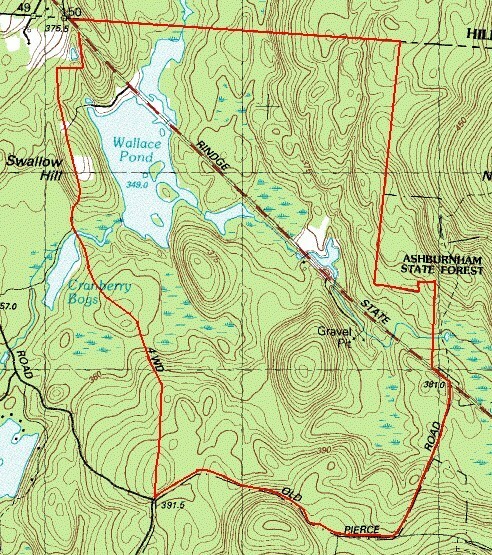 Below is a topographical map showing the boundaries (in red) of the club's land. Our land is maintained by the club under a Chapter 61 Forestry Plan which allows the club to manage the land to provide optimal benefit for wildlife. Our field areas provide quality wildlife habitat for a variety of species including non-migratory birds like Ring-necked pheasant, Wild Turkey, and Red-tail Hawks. Alpine birds like Snowy Owl, Rough-legged Hawk, Common Redpoll, and Snow Bunting seek open grasslands during New England winters. Foxes, woodchucks, deer, and many species of butterﬂies and dragonﬂies use field habitat as well.